Journal : Atlanta Medical and Surgical Journal ; vol. 12. Atlanta : Dunlop, Wynne & Co., 1875. Description : 154-155 p., [1 l.] pl. ; ill.: 1 phot. ; 23 cm. Photograph : photograph mounted to printed leaf, representing a fetal monster. Photographer : Bowdoin [of Atlanta]. 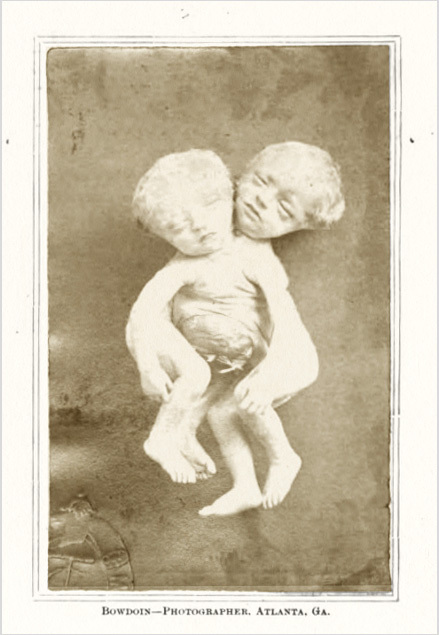 Subject : Monsters — Thoracopagus twins. Author caption: Dr. Battey exhibited...etc. Medical degree, University of Pennsylvania, 1857. Professor, obstetrics, Atlanta Medical College, 1873. GM-6062: Battey's operation. Ovariotomy of healthy ovaries to cure uterine fibroids and other conditions. GM-6071: R. Lawson Tait's claim against Battey, for priority in removal of normal ovaries. Photo caption: Double Monster. From Bartow county, Georgia, exhibited to the Atlanta Academy of Medicine, April 27th. by Robert Battey, M.D.–See Proceedings of the Academy.